Some books have all the luck. The authors get million dollar advances, spots on The Today Show or picked by Oprah. Those books are right in your face at the bookstore. Unfortunately, those books hog all the spotlight while the smaller, quieter books gather dust somewhere in the back whispering, "Excuse me, over here!" If a blogger is lucky enough to find one of these little beauties and rave about it on their blog, we're often frustrated when that post gets little attention. Is it just me? Am I the only champion of this book? we think to ourselves. Now is a chance to highlight the forgotten treasure on our shelves once again. 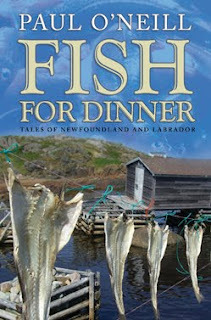 Earlier this year I discovered a whimsical little book at the library: Fish for Dinner by Paul O'Neill. It's a collection of fairy tales with a Newfoundland twist and I bet you've never read anything else quite like it. Each story has a beautiful illustration by Tara Fleming. I hope you have a look at my review and have a peek at the book. I included a link to the publisher website in that post. This sounds really good, and who couldn't use a little whimsy in their life, right? It's going on my wish list. Thanks! Never heard of this, but you do make it sound worth reading, so on my list it goes, too. This one sounds right up my alley. I love a good fairy tale, no matter what the twist. I know what you mean. People complain that the same books get all the buzz, but when you review something totally different, it kind of gets ignored. I'm going to make a note of this one. Can't quite imagine what this book would be like, but now it's on my radar. Thanks! The book SOUNDS good, but I don't think I could deal with that horrifying cover for long enough to actually read it. .. I don't read a lot of fairy tales, but this one sounds interesting. Thanks for the spotlight! I had this out from the library but didn't get a chance to read it. I am going to go request it again! Love the cover, the inside sounds very interesting.